Microsoft announced the Windows Phone 7 OS for handheld devices on Monday, taking a step forward in the company’s efforts to strengthen its position in the still-growing smartphone market. CEO Steve Ballmer unveiled the first phones to run the OS, and named the network operators that will distribute them. “We wanted the Windows Phone to be delightful across a range of hardware devices, through a range of scenarios, and a [range] of different software experiences,” Ballmer said. HTC’s HD7 smartphone will arrive in the U.S. in mid-November, courtesy of T-Mobile. The phone is one of many introduced Monday that will run on the new Windows Phone 7 platform. The company wanted to make Phone 7 “always delightful” and “wonderfully mine,” he said, emphasizing the way that users will be able to customize the user interface. “Everyone should look at the phone and represent themselves on the device,” he said. Microsoft has already owned up to one curious omission from the first release of Windows Phone 7. The OS lacks copy and paste functions: Microsoft plans to add them in the first update, due for release next year. Apple drew heavy criticism for leaving those same functions out of the first few versions of its iPhone software. The company has partnered with many phone makers and wireless carriers to bring Windows Phone 7 handsets to consumers in early November, Ballmer said at the OS launch event in New York City. Sixty mobile operators will be offering it in 30 countries, Ballmer said. The operators include América Móvil, AT&T, Deutsche Telekom, Movistar, O2, Orange, SFR, SingTel, Telstra, Telus, T-Mobile USA and Vodafone. Nine different phones, from HTC, Dell, Samsung and LG Electronics, will be available in the U.S. in November. The phones will be able to take video, access social media applications, gaming and access streaming movies and TV shows, Ballmer said. In Europe, Orange plans to launch three Windows Phone 7 devices. The HTC 7 Mozart, which will be exclusive to Orange, will be available in France, the U.K., Spain, Poland, Switzerland, Romania, Portugal and Austria. The Samsung Omnia will be available in France, the U.K. and Switzerland, with the LG Optimus 7 available in France about six weeks ahead of other operators, Microsoft said. The phones will be available first in the U.K. and France. T-Mobile said it will distribute the HTC HD7 in the U.S. in mid-November, in time for the year-end holiday shopping season. 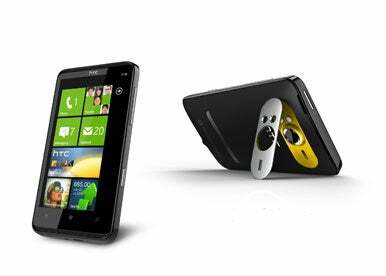 The phone has a 4.3-inch touchscreen display and has includes Netflix, T-Mobile TV, Xbox LIVE and Zune software. AT&T will be launching Samsung’s Focus smartphone on Nov. 8 in the U.S.
Windows Phone 7 is a totally revamped operating system, designed by Microsoft to better compete with new rivals in the mobile market such as Apple and Google. The operating system was a long time in the making. Apple’s iPhone launched in early 2007 and by the end of that first year it had outsold all Windows Mobile devices in the U.S., according to researchers at Canalys. Microsoft released the stopgap Windows Mobile 6.5 in 2009, but it failed to reverse Microsoft’s slide in the mobile market. The new operating system tries to differentiate itself from rival OSes by categorizing applications, services and Web content under hubs, which helps provide related information in a single view. The people hub, for example, aggregates phone calls, text messages, social media feeds and Outlook e-mail messages in a single view. The information is updated in real-time and users don’t have to go through multiple applications to view the related information. The games hub will host games from the Xbox Live online gaming service. The hubs also includes music and video, marketplace (for applications), office (for business applications) and pictures. Users can shoot pictures with the phone and upload them to the cloud in just a few seconds. Users can do voice search through the Bing search engine. The company also has mobile versions of the Microsoft Office productivity applications, including Microsoft Word Mobile, Excel Mobile, and PowerPoint Mobile. Users can also access collaboration documents in the cloud through Microsoft SharePoint Workspace Mobile 2010. An application called OneNote allows users to sync notes taken on the phone to a PC through the cloud. While Microsoft is in an underdog position competing against market leaders Research In Motion, Apple and Google, it offers notable benefits. Enterprise IT managers are likely to gravitate toward Windows Phone 7 devices because they’ll work well with Exchange and other widely used enterprise software from Microsoft. In addition, Microsoft has said that it is determined to succeed in the mobile market. With its deep pockets, it is likely to continue to invest in improving the standing of Windows Phone 7 in the mobile market. Finally, Microsoft has recently been pointing out that its broad patent position protects handset makers who choose to build phones using Windows Phone 7. This is becoming an important issue, as Android faces legal threats from Oracle, Microsoft and Apple. IDC in a recent study placed the market share of Windows mobile operating systems on devices like smartphones at 6.8 percent, behind Symbian, which took the top spot, Research in Motion’s Blackberry OS, Google’s Android and Apple’s iOS. IDC expects upcoming Windows mobile operating systems to help Microsoft regain market share, reaching 9.8 percent by 2014. Jeremy Kirk of IDG News Service in London contributed to this report.